This pioneering effort was formalized in the spring. The program envisions chess instruction taking place in multiple schools throughout the district; however, not all classes would necessarily take place during the full school day. The chess club currently provides some after-school chess programming to a handful of city schools. Last year, the scholastic department of Chess Club and Scholastic Center offered chess instruction to more than 50 schools in the St. Louis area, which translated to more than 900 chess classes taking place over the 2015-16 academic year. In addition, the club welcomed more than 200 students to its campus in the Central West End through a series of seven field trips. The children explored the site at which the world’s top 10 chess players convene every year to battle for the Sinquefield Cup, North America’s most prestigious chess tournament. Students at Walnut Grove Elementary School responded with enthusiasm to a chess presentation. The chess club also impacts scholastic chess through its teacher training and certification program. It runs ongoing teacher training programs, which cover the basic rules of the game such as board geography and piece movement, as well as sportsmanship protocols and the game’s evolution throughout history. 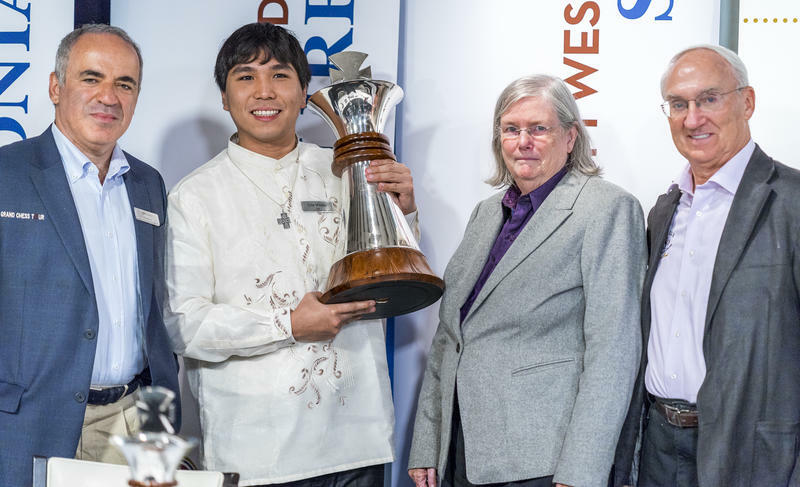 The summer is one of the busiest seasons for the club: The Sinquefield Cup takes place every August, and, in tandem, at least five week-long summer camps are hosted by the Chess Club. More than 200 chess campers get intensive high-quality chess instruction from an array of International Masters and Grandmasters. This summer, the club was pleased to welcome campers from Kennard Classical Junior Academy within the St. Louis Public School District. The Chess Club partners with education researchers from the University of Missouri to evaluate its scholastic chess program’s ability to improve student achievement, particularly in non-cognitive areas such as confidence, enthusiasm for learning, positive behavior and critical thinking skills – all key elements in a student’s success. Overall, the scholastic department at the Chess Club is bringing chess to the classroom thus emphasizing the benefits of chess. It is the club’s hope that these programs will help to develop confident, high achieving students in the St. Louis area. While the club is working in the community, it also holds classes at the Chess Club in the Central West End - working with about 2,000 students in the last year. By investing in youth, CCSCSL is investing in the betterment of St. Louis and keeping the game of chess alive and well for many years to come. Funding for the program comes from a mix of local and national foundations and corporations such as the St. Louis Philanthropic Organization Inc., the Lesley A. Waldheim Charitable Foundation, the Horncrest Foundation, the AT&T Foundation, Ameren Missouri, the Graybar Foundation, and Suzy and Rick Gilbert. To learn more about the Chess Club’s ongoing research and club programs, visit https://saintlouischessclub.org/. Kareem Talhouni is the new scholastics manager at the Chess Club and Scholastic Center of Saint Louis. Talhouni, along with his team of scholastic coordinators, is working to bring chess to local schools throughout the area. Talhouni and team have a group of chess instructors that go directly to schools to work with students. It is the scholastic department’s hope to keep expanding their work to help the St. Louis community benefit from the game of chess.